Sure you can buy books on Amazon, but nothing compares to going to a bookstore and picking out the right title by hand. Here are some unique bookstores that are filled with as much charm as they are books. 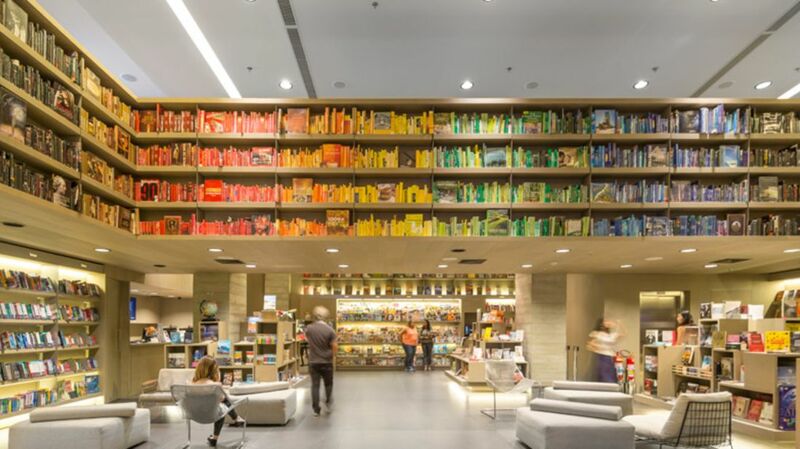 This Rio de Janeiro bookstore features a rainbow made of books that wraps around the shop. Although those titles are not for sale, there are plenty of options available on the ground floor. Despite its large size, the creators wanted the store to feel cozy and welcoming. Color is an important theme of the establishment: The top-floor children’s section also features a multi-hued, striped seating area. Bookstores can be located in just about about any kind of building. Waanders In de Broeren has taken up residence in a renovated 15th-century cathedral northeast of Amsterdam in the municipality of Zwolle. The store preserved a lot of the church’s original features, including the nave and enormous wood organ. "We wanted all the additions made to the church to be sober, in respect to the church, modest," the architects explained. This decommissioned postal train in Auvers-Sur-Oise, France, is filled to the gills with books. It may not look like much from the outside, but La Caverne aux Livres—The Cave of Books—is home to thousands of books from all genres and eras. Former journalist Sarah Henshaw didn't know much about boats, or owning a business, when she first opened the Book Barge in 2009. She gutted a canal boat that she bought with money borrowed from her parents, and filled it with donated books that were given in response to a plea in a newspaper. Today the floating bookshop sells carefully curated books that stray from the bestseller list. Visitors can climb aboard at the Barton Marina in Staffordshire, England, on Saturdays. If you want to truly be surrounded by books, consider Livraria da Vila. This São Paulo bookstore is housed in a uniquely structured building with revolving bookshelves that make up the storefront. The multi-level former house also has books lining the space from floor to ceiling, and a large circular hole in between the first floor and basement that's also lined in books. As the name suggests, William Faulkner once inhabited this New Orleans apartment. Although he only stayed for six months in 1925, the space kept its literary ties. Owners Joe DeSalvo and Rosemary James fixed up the apartment and transformed it into a bookstore that carries rare publications, first edition classics, and books by and about Faulkner. It’s said that the ghost of the writer still hangs around some of the female staff, and occasionally hits on them. Nestled in a historic mansion on the Upper East Side of Manhattan, this French and English bookshop—a project of the French embassy—is as charming as it gets. The upstairs has a beautiful zodiac mural overhead, reminiscent of the one in Grand Central. The fresco is inspired by the Italian Renaissance, when the line between science and poetry was much fuzzier. Bart’s Books is said to be the largest independently owned and operated outdoor bookstore in the country. Richard Bartinsdale opened the store in Ojai, California, in the '60s, when he found his personal collection was getting overwhelming. Bartinsdale initially used coffee cans instead of a register; the honor system is still in place today. With books as cheap as 35 cents, it's easy enough to cough up the change. Literary New Yorkers have long known of the book speakeasy Brazenhead Books, once tucked away in a rent-controlled apartment. “Some nights, it’s more like a book nightclub than a bookstore,” owner Michael Seidenberg told The New York Times. The store was recently forced to close after the landlord evicted Seidenberg, but he is currently looking for a new location for his book collection. Previously a firehouse, Spotty Dog Books & Ale in Hudson, New York, now operates as a bar-bookstore hybrid that lets you grab a beer while you peruse the shelves. The bar prides itself on serving a wide variety of craft beers, mostly from nearby breweries. Members of the former firehouse, C.H. Evans Hook & Ladder Co., will sometimes revisit the bar and reminisce over a beer. Libreria Acqua Alta in Venice, Italy, is known for its unusual book storage solutions. Visitors can rummage through books kept in bathtubs, boats, and other unusual containers. The nautically themed bookstore even has a full-sized gondola that floats when the store floods (the name literally means “library of high water”). This fantastic bookshop will probably have any book you need, but those with allergies should steer clear: Besides the thick coat of dust, there are also a number of cats prowling around the shelves.